Italy was so much fun. We started in milan and then went to florence and rome. 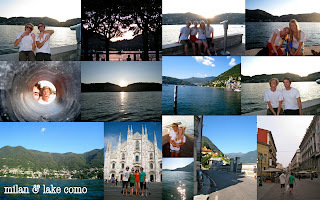 While we were in milan we went to lake como, one of my favorite places in italy. highly recommended to go there. It was so pretty, we just went for the day and took a boat fairy around the different little towns. Milan was an adventure because we had to find the e.r. cause shan got some sort of odd rash... it made our time there a little more exciting, and no worries she is fine! After milan we went to florence, that was really fun. Our hostel was really cool, they had a pool, sauna, disco club, and every room had their own bathroom so it was extremely nice for a really good price. 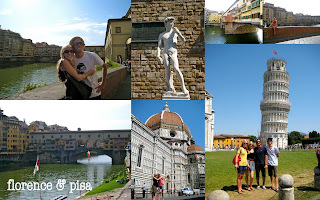 While we were there we saw the david, duomo, the famous florence bridge and other random little sites. I had a mishap while there. When we were in line for the david i got hit with some bird poop.. in my hair.. it was really gross so that set us back a little, but gave everyone a good laugh for the rest of the day! On our way going to rome, we took a detour to pisa to get some pictures in at the leaning tower of pisa. 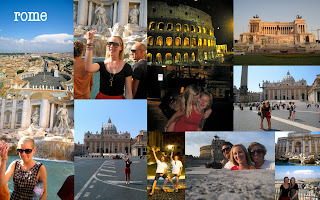 Rome i think is on everyones top list of where to go now. We had a great time there. We stayed in a perfect location, it only took about 5-10 minutes to walk to the coliseum, & about 15 to the trevi fountain, so it was really easy to get around. While we were there we went to st. peters square, climbed to the top of the vatican, made a wish at the trevi fountain, ate dinner while looking at the coliseum, and wandered all over the city. The trip was amazing, everyone became so close in the end and we all had so much fun.